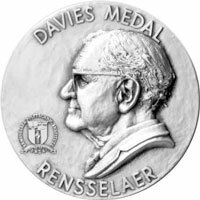 In honor of one of Rensselaer’s most accomplished, active, and loyal alumni, Clarence E. Davies ’14, Rensselaer Polytechnic Institute established the Davies Medal for Engineering Achievement. A distinguished career in engineering education, encompassing teaching, research, and administration. Engineering achievement of benefit to mankind through its universal application. Outstanding public service through an engineering profession. Outstanding technical and managerial accomplishments in corporate or government engineering projects. Recognition for important research projects, product design or construction in professional practice. This award is funded by an endowment from Mr. and Mrs. J. Erik Jonsson ’22. The Davies Medal was first awarded in 1980.